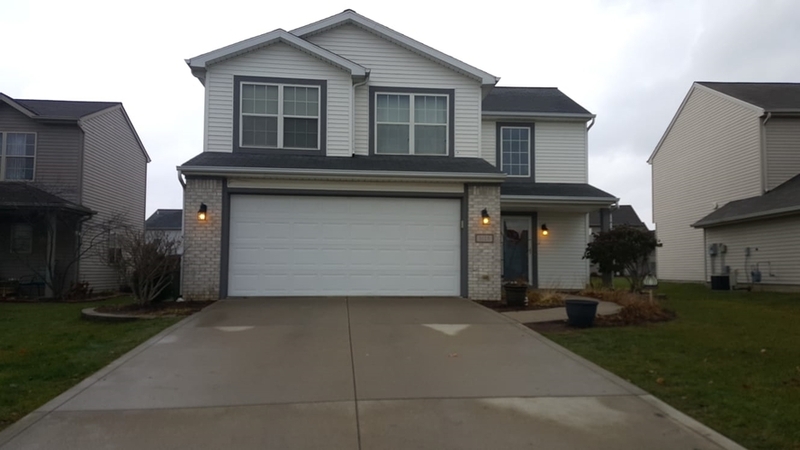 Stop in and see this great 2 story home out in the coveted NACS school district! Tucked away in the family friendly Timberon addition, this home features 3BR/2.5BA and a lot of open living space! Enter in and immediately be awe-struck by the scaling vaulted ceiling and open concept layout. Enjoy vinyl plank flooring and tile throughout the entire main level of the home. The living room boasts a beautiful fireplace and huge windows on either side letting in an abundance of natural light. From there, head into the dining room where you can entertain and converse over all of your family dinners or holiday events. The kitchen is just to the side and has a lot of cabinet space and a pantry for all of your kitchen needs. All kitchen appliances stay with the home! Laundry is off of the kitchen on the main floor as well, along with a half bath just past the front door for easy access and guest use. Make your way upstairs and find all 3 bedrooms including your master ensuite and another separate full bath. The bathrooms feature granite countertops and plenty of storage. The spacious master bedroom is a nice intimate place to retire to at the end of the evening and has a huge walk-in closet. If you are looking for outdoor space, then you are in luck! Off of the dining room you can travel out back and grill out and entertain on the huge stamped concrete patio while watching your pets and kids run free in the huge fenced in backyard. There is plenty of room out back for the garden lover where you can plant all of your favorite fruits, veggies, and spices to stock up for the year. Located in a hot and prime location, near lots of shopping, groceries, and restaurants, this home will be gone in the blink of an eye. Make sure you make this your new home today!